The ballet’s rambling narrative is loosely based on Théophile Gautier’s 1857 novel “The Romance of a Mummy”. Fueled by opium, an English explorer imagines a slew of adventures with Aspicia, the daughter of an Egyptian pharaoh. Aspicia, a mummy, resurrected from her sarcophagus, goes hunting and is saved from a lion’s wrath by the heroic Egyptian Taor (the Englishman), with whom she naturally falls in love. The duo, contending with Aspicia’s forced marriage to the King of Nubia, elopes to an idyllic fishing village. There, they are met by further hazards: suicide attempts, a detour to the underwater realm of the God of the river Nile, and more. Finally, Aspicia and Taor are reunited and happily married – until at the height of the rejoicing, the Englishman awakes from his dream. Although ridiculously inconsistent (thunderbolts and lashing rain in the Egyptian desert? The divine snake of Isis with her lethally poisonous bite in a flower tub? 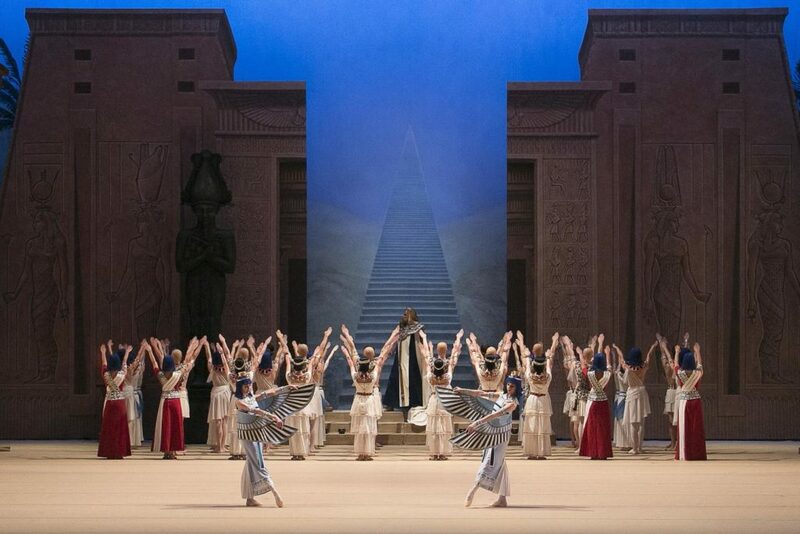 ), the libretto offers ample opportunities for dance, scaling from solo variations to the ceremonious entry of the pharaoh’s entire court. That said, it’s also good fodder for advocates of political correctness on stage. The slave (Yuri Ostrovsky / Georgy Gusev) guarding the secret door through which the lovers escape from the palace is, for example, black and jewelry-grabby. He’s the first – and luckily only one – to die from the snake’s fatal bite. Ramze (Alexandra Trikoz / Dariya Khokhlova), Aspicia’s slave, is a Nubian and in blackface. She’s accompanied by four children-slaves in chocolate-brown costumes, who also wear a brown make-up. One could discuss whether Lacotte should have adjusted these roles to today’s ethics. Or whether he was right in respecting the integrity of Petipa’s work. But is there actually any reason to fuss about what people dream in an opium rush? Lacotte French-itized Petipa’s strictly classical choreography (i.e. 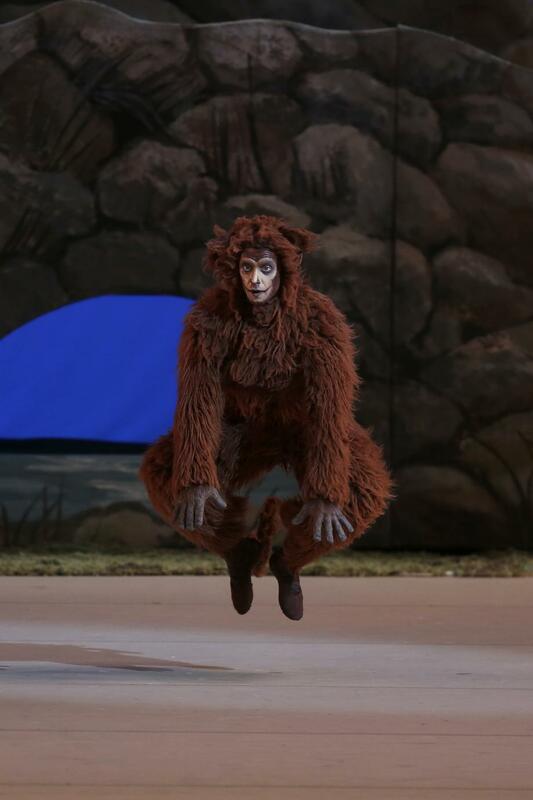 more challenging steps in less time on top of an already sufficient amount of dance) and gave a few roles more weight. Cesare Pugni’s score was laboriously reconstructed from fragmented sources by the late conductor Alexander Sotnikov. He wrote in the program booklet that “the music (…) is very pleasant but, strictly speaking, it needs to be rearranged. But if this were done, it would not be Pugni and the atmosphere of the age would be lost.” Andreas Roller’s original décor – the monumental halls of the pharaoh’s palace (for which he was awarded the moniker “academic”), an Egyptian forest, an underwater grotto, and a fisherman’s hut – were re-created by Lacotte. They and the costumes (also by Lacotte) are the main tribute to Egyptian culture. 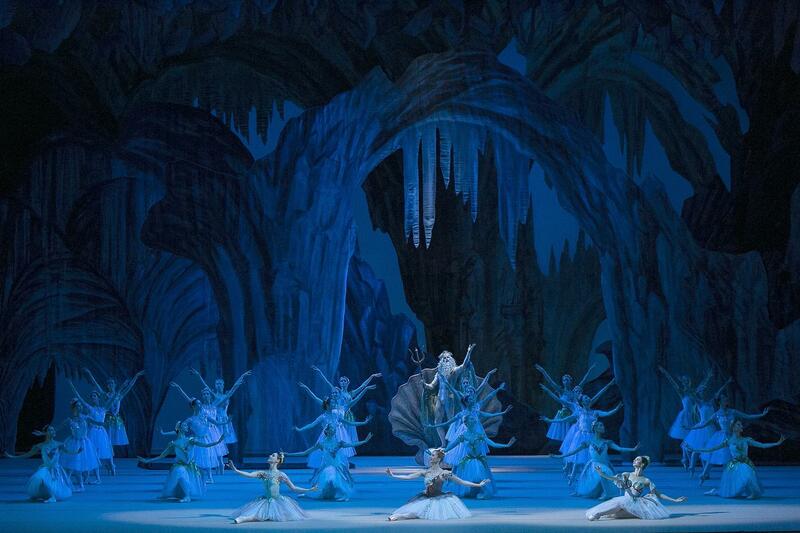 Watching the performance of petite Obraztsova, I thought of the natural perfection of a lustrous pearl. Her Aspicia leapt and sliced the air trenchantly when hunting for the lion and flew as softly as a feather when in Taor’s arms. Both Lopatin and Skvortsov portrayed Taor as adoring of Aspicia and gentlemanly to the core. Their excellent partnering made their ballerinas shine. I saw the performances on March 8th, International Women’s Day. Could there be better role models than these two men? I marveled at how well Lopatin and Skvortsov sailed through one tricky variation whose many changes of direction and stop-and-go made it hard to keep the flow. 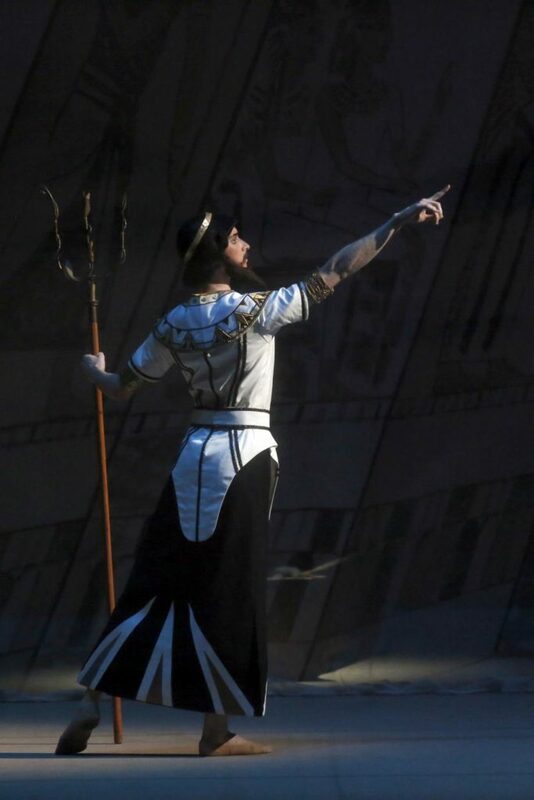 Taor’s vinous, food-loving servant Passiphonte (Vitaly Getmanov in both performances) served his master faithfully and – if the opium dream had lasted a bit longer – would certainly have hit on Ramze. Khokhlova’s Ramze was slightly firmer in keeping Taor at a distance from Aspicia than Trikoz’s, but later both collaborated equally devoted with the fugitive lovers. 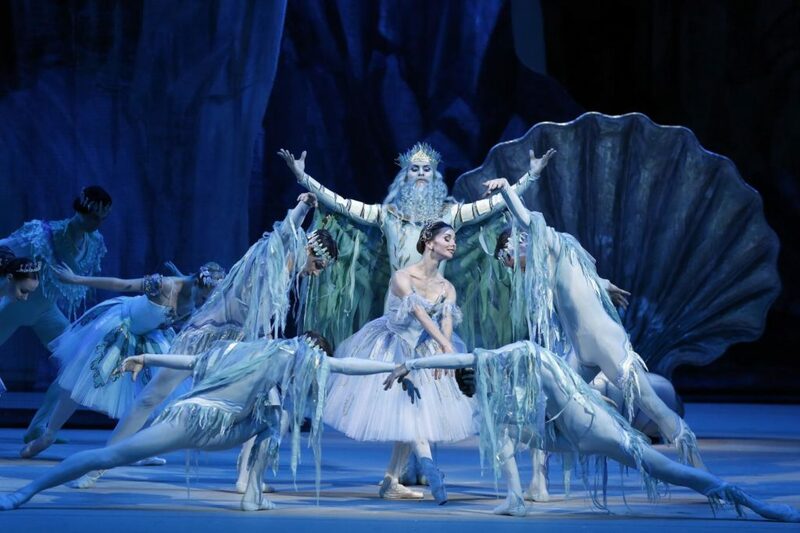 Denis Zakharov and Elizaveta Krutelyova depicted the fisherman and his wife at the matinee, both dancing with such confidence and elegance that they could be easily transferred to court. In the evening, Mark Chino’s fisherman soared while his wife (Eleonora Sevenard) danced with less sophistication and more earthiness, as common folk do. The differences, however, were subtle. Both Andrey Sitnikov’s and Alexander Fadeyechev’s pharaohs radiated an aura of power, while the God of the river Nile (Alexander Vodopetov / Ivan Alexeyev) reigned calmly. I especially liked the cheeky monkey (Grigory Chapaev / Alexander Pshenitsyn) wangling oranges from Taor – and as the role has been previously interpreted by Vaslav Nijinsky and the twelve-year-old George Balanchine, playing this monkey might be the stepping stone for a grand career! The corps danced with admirable élan as warriors, members of the court, and underwater creatures. 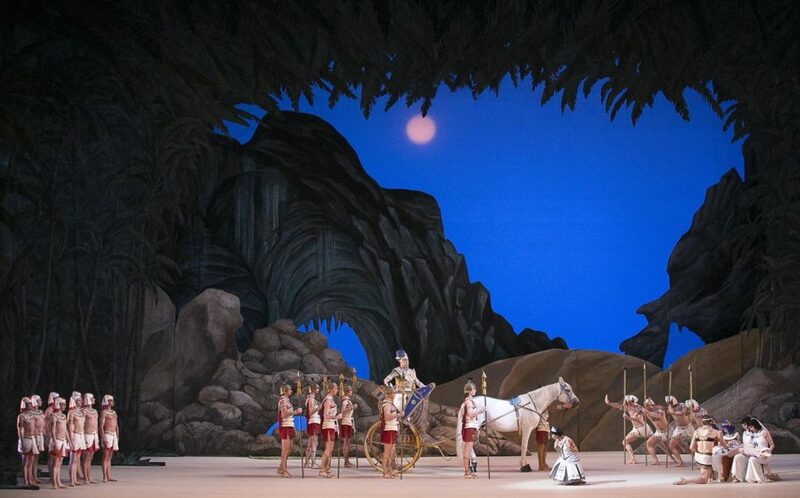 The lines of male warriors crossing the stage with jeté jumps, spears in the ready, looked terrific. Their female counterparts were similarly intrepid and experts with their bows and arrows. Three variations were centered around rivers: the solo on Andalusian’s Guadalquivir danced by Bruna Catanhede Gaglianone / Olga Marchenkova, accompanied by castanets; Ana Turazashvili / Angelina Vlashinet’s solo on Africa’s Congo, marked by the pings of a triangle; and a variation on Russia’s Neva propelled by dreamy music that lifted Antonina Chapkina / Maria Vinogradova. Pavel Klinichev conducted the Bolshoi Orchestra at both performances. While the matinee lacked luster, the evening’s rendition was rousing. 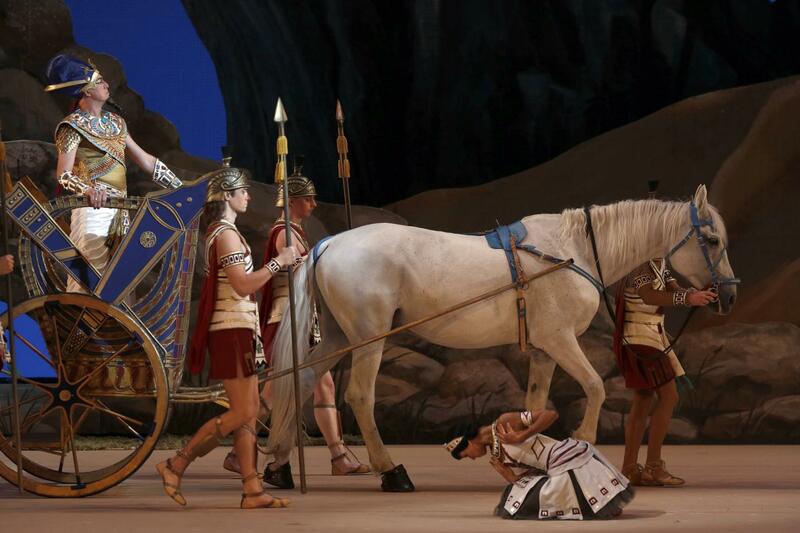 “La Fille du Pharaon” has been hugely popular with the public. According to an article in the program booklet, previous audiences not only waved handkerchiefs, but also shook bedsheets and shawls from the upper tiers. On this occasion, one balletomane even fell from the second tier in the orchestra pit. Today’s audiences, however, – inside the theater and out – struggle to put down their smart- phones. The pre-show announcement asking the audience to switch off their mobile phones seems all for nothing. My neighbor, for example, checked her text messages every few minutes and spent the breaks taking selfies which she then edited during the performance. At curtain calls, people are busy taking photos rather than clapping. Will we need to play recorded applause some day? The Bolshoi has its claque, certainly, but their “bravos” sound too zealous to read as believable enthusiasm. On the first floor of the theater, a temporary exhibition displays photos and videos of the Bolshoi’s acclaimed ballerina Ekaterina Maximova, who died ten years ago at age seventy.